Selenium 100mcg 100mcg 100 tab. 1 tablet 1-2 times a day during the meal. Highly digestible selenium - a precious microelement, which we often forget about. Meanwhile, taking care of the appropriate level of selenium in the body is an integral part of health care. Adding products containing selenium should be considered especially when people eat a lot of carbohydrates and highly processed products. Pastries, sweetened cereals and sugar can destroy the whole selenium. Proper work the thyroid gland is quite a lot depends on the level of selenium. Slows the aging process and activates the autoimmune system. Recommended product contains high, optimal health dose of selenium, which is why 1 capsule a day is enough to fully cover the needs of the body. 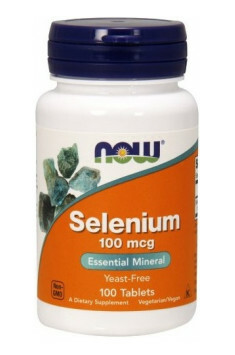 Selenium supplementation can not be at the same time as the zinc supplementation. These substances weaken each other absorption. Concentrated form of phosphatidylserine from sunflower lecithin. Top quality confirmed with the trade mark Cogni-PS. Natural ingredients with high potency. They show thermogenic properties and regulate metabolism.